Portrait photography is one of the main photographic genres, something that most of us work on, wrestle with, master or decide to walk away from in disgust! It can be tricky, demanding, difficult but oh-so-rewarding when it works. Here are some thoughts about the main types of portraits, what makes a great portrait, and how to go about shooting a decent one. Usually when we think about portraits, we think about photographs of people. Indeed, a person will almost always be the main focal point of a good portrait. Within this very broad class of images, portraits can generally be divided into two categories: formal portraits and environmental portraits. By ‘formal portraits’ I mean a portrait in which the subject is removed from his or her surroundings, usually by the use of some type of backdrop. Background paper or muslin or canvas are typical backgrounds used for this type of photograph, and the results can be stunning. By removing all distraction of the surrounding environment, your eye is left to ponder and study the person before you: whether young or old, happy, sad or indifferent, these images can be extremely powerful by the sheer force of the personality portrayed, when in the hands of a talented portrait photographer. Some of Irving Penn's iconic portraits on Flickr. My favorite ‘formal portrait’ photographer of all time is Irving Penn, about whom I’ve written before in a piece about abstract photography. Penn was a genius with a camera when it came to portraiture. I think his work as a Vogue fashion photographer was part of what informed his portraits, with the pose usually something he was in complete control of. His portraits of Gertrude Stein and Tennessee Williams are great examples of this, as well as everything in ‘Worlds in a Small Room,’ his book of images of indigenous people around the world, all shot against his portable studio backdrop, natural light, with a 120mm Rolleiflex film camera. Environmental portraiture is the other main branch of this photographic tree. A good environmental portrait is more than just a photo of a person within the context of his surroundings, although at a minimum it’s certainly that. A good environmental portrait will use the surroundings to actually tell us something about the individual: it becomes part of the essential essence of the successful portrait. So maybe a race car driver is shot with his head inside the hood of his car, or with the track in the background, or whatever. The concert pianist is shot with some great composition that incorporates all or part of his instrument, etc. My favorite environmental portrait shooter is still Arnold Newman. He was an old school guy that became famous many years ago, shooting politicians, artists and celebrities for all of the major magazines in the 1960s and 70s. His photographs are still some of the best of this genre. If you’re not familiar with his work, you’ll want to check him out. One Mind’s Eye is the best collection of his portraits. It’s out of print but available used on Amazon. Whether you want to pursue formal or environmental portraiture, much of the approach will actually be the same. Your work starts before you go to shoot the portrait session. Do you know anything about this person? Their likes, dislikes, hobbies, interests? If they are a well-known inidividual, do a bit of online research to get a feel for them. This will give you ideas for your approach, each time a bit different, informed by what you’ve learned. If nothing else, it’ll serve as a great icebreaker when your subject realizes you cared enough to learn about them ahead of time. In order to get your subject to relax enough to reveal a bit about themselves to your camera, you must be able to transcend your equipment. By that I mean you must be so familiar with its workings and variables that you can spend little or no time fooling with it in the presence of your subject, spending all of your (and their) valuable time talking, chatting, schmoozing with them. You want them to relate to you as an individual, not as a scary stranger with a camera. So this means you need to practice, practice, practice! This is key. Practice really does make perfect when it comes to using your equipment. You want them to relate to you as an individual, not as a scary stranger with a camera. As you’re chatting and schmoozing, pay close, close attention to your subject and the light that’s falling on them. Work carefully on your composition but keep things simple. Shoot variations of your main idea, but work fast! You don’t want them getting tired or bored with you. Work through the ideas you have, see what develops. Frequently a failed idea with lead to something else that actually works. Keep at it, but quickly. When you’ve run through the ideas you’ve had, if you still feel that something is lacking, sometimes I’ve had luck by asking the subject for an idea: ‘Anything else you’d like me to try?’ can lead to some interesting results. Then, you’re done! I think one of the biggest mistakes you can make is to continue to beat on the proverbial dead horse: when you have completed what you started out to do, have enough respect for your subject to let them go! The photographers that come after you will thank you for it. 9 Comments on "How to Shoot Great Portraits"
I always admired great portraiture, and I grew up admiring the great portrait photographers. Portrait photography is a deceptively difficult art form; I rarely practiced it well. 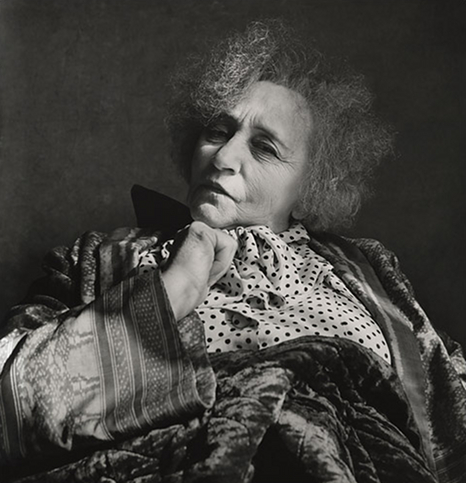 The man I most admired was Yousuf Karsh, probably because of his consummate craftsmanship. His reputation was sealed when he famously yanked a cigar from a recalcitrant Winston Churchill, then snapped his picture. Over the years I’ve shot many an interview with people I didn’t like. I rarely had the nerve to confront them when they were misbehaving. The people skills required for the art form are considerable and absent from my repertoire. Great point and a great story there. One of my favorites about Karsh too. It’s an interesting and challenging area to explore, isn’t it? And lots of great work to study for inspiration. Thanks for the info. Portrait photography was something I am stumbling into as well, being mainly a landscape photographer. I never thought I’d like it because I quiver at the thought of trying to figure out how to pose someone, but I am fascinated by natural light portrait photography. You get what you get. I have three family members that don’t mind sitting for me, but I’m wondering how much longer this will be fun for them. 😉 Anyway, thanks again for the great pointers! Do you have pointers on natural light portraits or posing? Really, really watch the light: how it plays across a face, how having the person turn changes the emotional content of what you get. This is true whether you’re shooting natural light or with lighting you bring to the shoot. Posing is half intuition, half practice, and another half luck! Shoot, shoot, shoot. Study other photogrpahers. Besides those already mentioned here, go look at the portraits of Avedon and Annie Lebivitz (http://www.pbs.org/wnet/americanmasters/episodes/annie-leibovitz/photo-gallery/19/).